Surforge is an editor extension that enables you to easily make quality 3d rendered PBR textures from scratch directly in Unity, with an extremely productive and intuitive workflow. The exported maps are fully compatible with Unity 5 Standard Shader, looking exactly the same as while you working on them. It's a modeling toolset, kitbash library, map render, and material composer. All in one, everything you need to create great textures. The main purpose of this software is ensuring efficiency. Designed to speed up the process of obtaining finished results, Surforge saves you time and resources, which is particularly beneficial for indie projects. 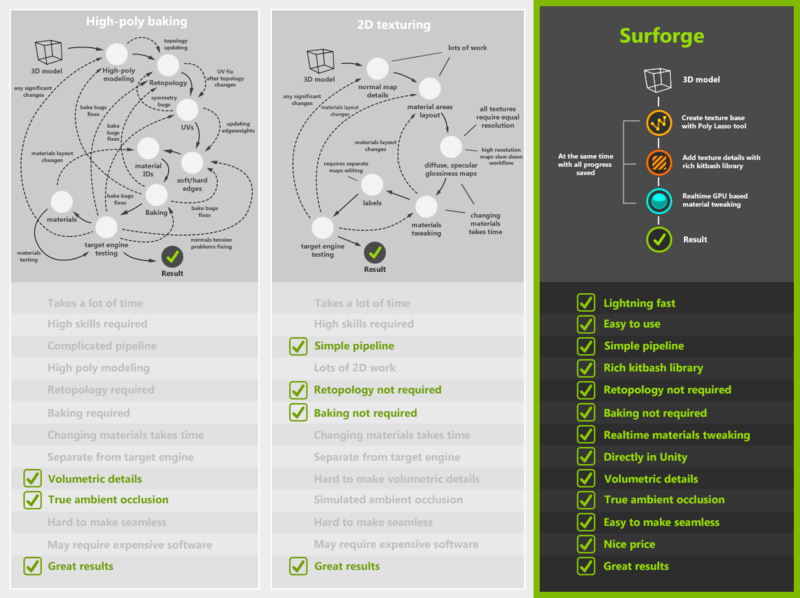 Surforge allows obtaining a large amount of texture content lightning fast. How can Surforge help my project? - Create seamless PBR material maps from scratch directly in Unity. - Easy to use: simple and handy toolset, no special skills required. - Powerful and effective tools allow you to get a result in minutes. - Full control: tweak any material aspect in real-time with instant feedback. - Create a preset and easily make materials in a unified manner. - High-quality ambient occlusion, dirt, worn edges baking in seconds. Zero time wasted. - Predictable results, looking exactly the same as while you working on them. The entire process is done in Unity 5 (free or pro). 1. The texture is created in 3D with efficient and easy-to-use tools. 2. A built-in GPU-based render is used to bake the necessary maps. The process takes a few seconds. 3. The composer shader enables fine-tuning of surface parameters such as worn edges, dirt, specular/gloss of particular areas, and mixing textures. The entire process being GPU-based, parameters change in real time with instant feedback. 4. Result maps are exported to .png and .tga files, fully compatible with Unity 5’s Standard Shader. They can also be used in wide range, including mobile, depending on the shaders with which they will be used.